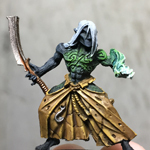 Hello guys, I was messing around on Battlescribe yesterday and looking at the best ways to convert the models I have from my Drukhari army to a Ynnari army. However, Battlescribe is telling me that a tantalus can't be a part of a Ynnari detachment. I can't find anything in the rules or the faqs so I was wondering if you guys could help me understand better. Is the tantalus really not allowed in a Ynnari army or is it just the Battlescribe data repository being outdated? ‘If the Warlord of your army is either Yvraine, the Visarch or the Yncarne then – with the exception of <Haemonculus Coven> units, Urien Rakarth, Drazhar, Mandrakes and the Avatar of Khaine – any Aeldari unit can also be Ynnari. Is the Tantalus an Aeldari unit? However, it is notorious for being just a little bit off... Not only in points, but sometimes wrong upgrades etc. I dont know the team behind battlescribe or how big it is, but 40k is still super complicated when it comes to creating a program that can figure all this stuff out. I dont envy whoever is coding it. Over all they have done an excellent job, but it doesnt get rid of the need to double check. Always take out each codex and math it out by hand. It annoying, but it saves you from traveling to a tournament only to be approached by a TO and told your list is invalid. Just out of curiosity, what are you doing to convert your guys to Ynnari? I dont think you have to do anything... But I am doing mostly spirit host so I plan on somehow making it look like yvraine put the souls into the wraith bodies. Still building so I havent got a chance to test anything out yet. Super excited to use wraithguard without having to webway them in with an Archon or Succubus lol. If that doesnt work out I will probably just do some kind of red trim like a shoulder pad or weapons. If you choose to play as Ynnari for some reason you don't have to do anything to convert the models, they're just regular CWE/DE models with a new keyword. It's purely aesthetic, if you want you might, but it's perfectly fluffy to have no conversions at all, like your army are fresh Ynnari converts. Their motiff is mostly red colors and a lot of people add a symbol of a bloody hand here and there. a lot of people add a symbol of a bloody hand here and there. That is what I was talking about doing in another thread, do a lot of people really do that? I thought I had a pretty original idea (well taken from the white hand in LOTR, but original for ynnari at least). I cant find anything online about bloody hands and ynnari either. If everyone is doing that, ill come up with something else. I know its cliche but I like trying to do something unique lol. I was speaking from looking at tournaments in my local area etc. Personally I think bloody hand is not a good Ynnari symbol, as Khaine is the Bloody-handed god. However, the best Ynnari conversions so far that I saw are usually very subtle - small Ynnead rune here and there or tiny red stripes on a pauldron. My guys are just the normal CWE/DE with one pauldron or bit painted red (Ynnari color) with the Ynnead rune. Yvraine/Yncaern (sp? ), do they need to use spirit stones or can they bypass having to use them? I thought I read somewhere that they can store spirits inside themselves. Also, how exactly is a soul put into a wraith? I still cant find any info on that. Thinking maybe doing cracked spirit stones, but man that would be a lot of work, or maybe do like a red fade showing the wraithbone turning red because of the vicinity to the god of death. If they do need spirit stones, maybe Ill try and make it look like they have been in the eye of terror trying to collect more from the crone worlds. They don't use Spirit stones. Ynnead absorbs their souls through the Ynnari. Hmm so maybe they dont make wraiths at all or they do just without spirit stones? I mean, I guess they wouldnt need to stone to put the spirit in the bodies as the stone is just like a black box for your spirit. Maybe I could black them all out like they are missing or inactive. I wonder if I could convert spiritseers with heamonculi parts seeing as ynnari dont need spirit stones, a spiritseer would act more as a wraithsuit repairer. They carry spirit stones to channel the dead spirits through them or w/e because it conveniently allows you to continue to use existing models. I thought they carried spirit stones to extract the souls stored to power themselves, sorta like backup batteries. The Yncarne is generated by the spirit stones swirling around her/him/it. They still carry the stones (for sentimental reasons, tradition, or 'backup batteries,') I just don't think they use them for the same purpose anymore. Idk don't think too hard about it. GW didn't. Say what you want about the rules, but the amount of thought and debate that goes into crafting the background lore is prodigious. It was prodigious, prior to the gathering storm books however. The gulf between the wonderful narrative of yore and the current offerings is... well... are you familiar with the Marianas Trench? If we don't who will? actually, say what you want. Since the subject of the conversation seems to have wildly shifted from rules to lore, moving the thread to the appropriate forum.